Happiness is... a Bunch of Really Old Orcs! Lately, I've been looking to scratch my Oldhammer itch - you know? Playing Warhammer Fantasy Battle ("WFB") using 3rd edition or earlier, preferably with some old, Citadel lead-y goodness? This is something I've been thinking about on and off for a few years - ever since I discovered the Oldhammer movement. I was attracted by the passion and the old-school aesthetic more than by nostalgia. You see, I didn't play Warhammer Fantasy - I was firmly a Warhammer 40,000: Rogue Trader guy. (And don't get me started on the INQ28 movement - I'm trying to stay focused here!) I had an abortive attempt at WFB 4th edition in the nineties, which included a whopping two battles, one of which was a brilliant home-cooked scenario involving a pitched battle between high elves and goblins, and two sleeping dwarf heroes who were rudely awakened by said battle and proceeded to rout both forces from the field. Despite that memorable game, WFB never took off for me or my game group. We were just too deeply entrenched in 40K to make the move to Fantasy. But Oldhammer holds a deep appeal for me. I had the good fortune to find a cheap ($7?) copy of the WFB 3rd edition hardback some years ago, and fell in love instantly. And even though I don't play WFB, I've been collecting forces for the game for decades - partially to meet my Warhammer Quest (and, to a lesser extent, Mordheim) needs, but also because I keep meaning to get a series of full-fledged WFB games off the ground - one of these days. To that end, I've bought each of the last few "big box" WFB starter sets (Battle for Skull Pass and Island of Blood, for dwarfs and goblins, and high elves and skaven, respectively) and grabbed a few other miniatures to build a small army each for the undead and wood elf factions. So I've got the rules and I've got enough models (even if they're not all old-school Citadel lead). As the days pass, the time feels ever more right to strike the hammer on the Oldhammer anvil. But something was missing. Namely: orcs. I have a soft spot for orcs. 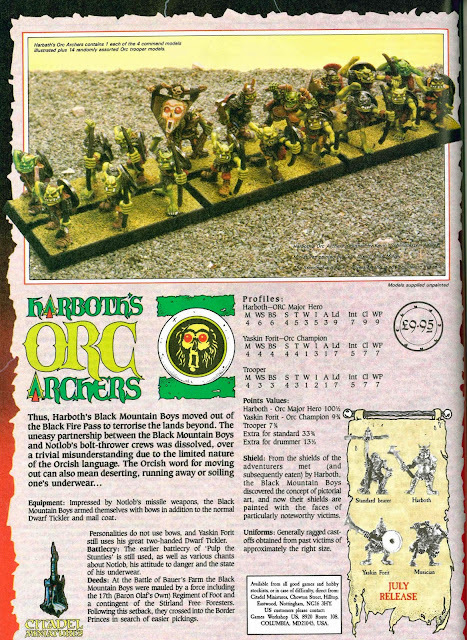 Specifically, orcs as represented by the sometimes goofy, almost-always characterful Citadel lead of the late '80s. I was reminded of this love after watching a Mordheim battle report on YouTube a few weeks ago. I loved the old orc and troll models used in the report (and the characterization of them was brilliant, IMHO). 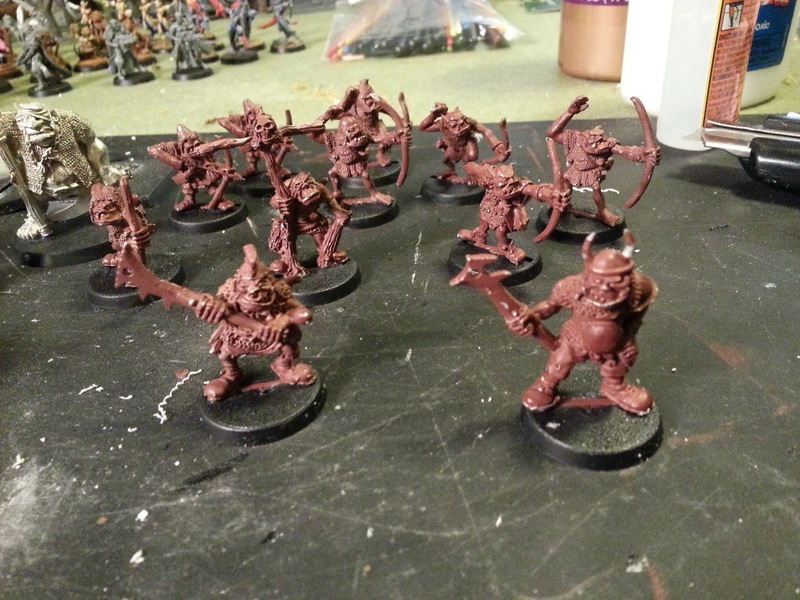 So I was inspired to put together a small force of old-school orcs to lead my goblins into an imminent foray into Oldhammer.. I needed just a handful of old orc models. How costly could that be? Very costly, as it turns out. I spent several nights combing teh interwebs for old Citadel orcs. 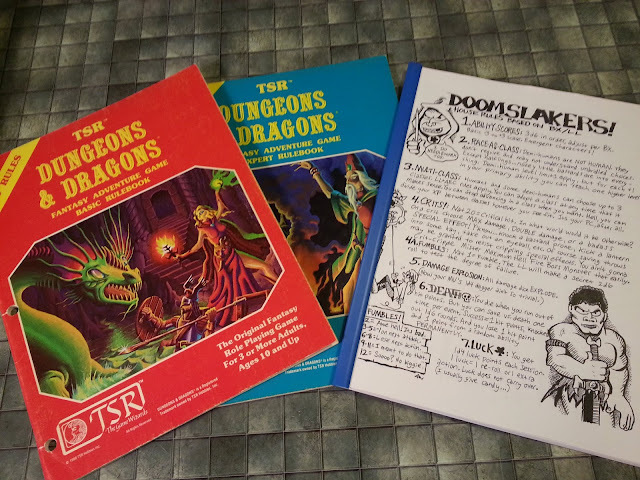 What I quickly discovered (and could not disprove during many more hours of searching) was that feeding my mania was going to cost me upwards of $10 per model. And much more for the truly characterful models I was hoping to add to my collection. By the third night (~24 hours of surfing!) I had almost resigned myself to abandoning the search and giving up on my green dream. On a whim, I tried a more nebulous search that didn't refer to Citadel or Warhammer. The gang arrived a few days later, and they're even better in person. I've been putting new slotta bases on these boys and adding some old, 4th edition goblin shields to them (unfortunately, they didn't come with their original shields). Let me tell you: every time I pick up one of these models I see some new detail that just shows off their character even more. And it makes me smile each and every time. Love these models.. I've been collecting Oldhammer models for a few years now. Just finishing off Chaos and Undead armies, but Orcs are on my list. I have both of box sets they made for Orcs (Harboth's and Ruglud's Armoured Orcs) and a handful of goblin wolf riders from this era. Maybe next year I'll get around to painting them..